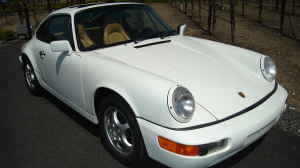 This is a very solid 911 with only 88k miles. It drives very strong and has very solid engine. It is 5-speed. 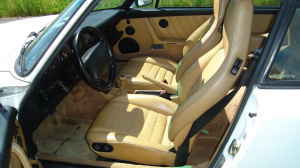 The interior is cashmere with dual leather power seats. It has all power moonroof, windows, locks, ac, abs, very nice sound system, etc,…The both exterior and interior are in good condition. Just got new battrey and tires and oil and filter. In a brief chat with my buddy Paul from Sports Car Shop, my personal Porsche expert and close friend, his first word were, “when are we headed down to buy this car? !” As you can tell, he agrees it looks like it’s worth a look! 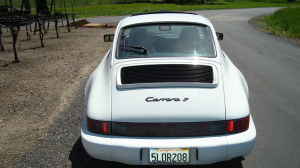 Tagged 911, 964, Porsche, white. Looks like a better deal than the red one. Those wheels are not correct for that year but thatâ€™s minor. There are 3 issues on a 1990. The first is there are no gaskets between the cylinders and the case, and theyâ€™re prone to leaking. Porsche changed the design in 1991 or 2 I forget. The second issue is the dual mass flywheel, which by this time in the cars life probably has already failed and been replaced. The final issue is the venting of gasses in the belt housing on the dual distributor. 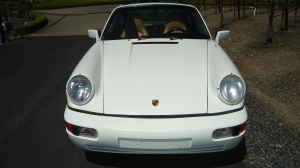 Porsche made a retro kit for this and itâ€™s a MUST have on any early 964. As I have said before I am a huge 964 fan having owned just about every variation of n/a 964â€¦ speedster, RSA, coupes you name it. Looks like a pretty reasonable deal depending on what a PPI uncovers but not a screaming deal.